Running is a joy. I lept out of bed on Sunday at 5:00 got ready and hit the trail. I dropped coffee from the diet completely 11 days ago. I had a "withdrawal day" about four days into the cold-turkey attempt. It was weird just being about to get up, get dressed, hydrate and stretch prior to heading out on the run. I managed to pace myself going up the hill to get on the trail. I've burned myself out early on that hill too many times. Not this day. I ran 13.2 with 1300 feet of elevation gain in 2 hours. It's one of the better runs I have put together in my two years of endurmadness. The kicker is, I was in control of the run. I only had two miles in the 10s -- the rest were 8s and 9s. I took in only two gels and 48 ounces of water. Pretty darn happy with the progress. It's no Pike's Peak but this run means I am getting there. Fun times this week! It's all good in the grand scheme of things though. Wednesday morning the shower woke us at 3 am. How? It was gurgling and spewing sewage out of the drain. Yummy, right? It is what it is. Stuff happens. It is a bit frustrating at times. My first step was to wait on Home Depot to open so that I could get a longer pipe snake. I did that. There is no ground-level clean-out on our house so I donned my red suit and hopped on my roof with a bag of coiled wire. Having bought a snake 50 feet in length I thought I could get some of the gunk out of the system. I worked and worked this wire down the vent tube until I hit something I could not work past. It was clogged about 30 feet into the back yard under 4 feet of dirt and tree roots galore. After the city shirked any help or responsibility, the plumbers showed up quickly. I was impressed by that. They confirmed what I already knew. There was a clog about 30 feet into the back yard and it was a full clog. There are roots in the pipe. Those fiberoptic cameras they use are fun! We all decided that it was best if we installed a couple of clean-outs for the house. One clean-out to go into and under the foundation and another to go out to the city main sewer. Wednesday evening Carrie and I dug. We dug a gash (8 feet long, 2 feet wide and 4 feet deep) in the back yard looking for the EXACT location of the pipe. We had a general idea but not an exact one. Four hours and two pickup truck loads of dirt later ... still no sign of the main. On Thursday afternoon the digging resumed. The plumbers re-located the line. We were about 12 inches to the left of where the line ran with our original hole. A new hole was started and the pipe was finally found at about 7pm that evening. So we just spent 3 days at Reevis Mountain with Peter Bigfoot. Bigfoot is probably most famous for his 15 day summertime trek across the Sonoran desert without food or water. Now, at 71, I think he could probably still do the same walk today. We spent the weekend learning about his lifestyle, off-grid living, some herbal remedies and his theories on life in general. He and his wife Patricia are very down-to-earth and thoughtful. Peter was off-grid and self-sufficient before it was a buzzword of Ted Talks. Truthfully, his way of life reminds me of the way my Grandpa Virgil lived up through the early 1990s. While Grandpa's house DID have running water and electricity; he refused to use it. He kept chickens, hogs and had a garden until he wasn't capabable. When did we get so "soft" as a species? Did it start with the spoils brought on in the post World War II era? Was it in the 60s? I could blame disco and the 70s, but that's too cliche'. Was it the 80s? I guess it doesn't matter when it started. It's just nice for me to know that I am getting back in touch with not only my upbringing but also the real human race. After a 50-mile running week in the previous week; I did the wise thing and took a rest week. Any ailments I had are now in the rearview ... and I am ready to continue the upward slope :-). Embrace it! The ability to love, live, breathe, eat and train. Yesterday was a good day. Over an hour of uphill running ... over an hour on the spin bike ... over an hour of yoga. All good things. They are all good days if you have your priorities right. Sure, there are sad moments. Every great baseball player in history went through a batting slump in his career. It's a matter of refocusing. A slump brings on a chance to change. Do something different and you will benefit. I know this sounds like "puppy dogs and rainbows" type stuff. I could sit and grumble most of the time. There's no doubt I'd have a ton of material about which to complain. The title of this blog post is inspired motion. What was I really thinking when I typed that? I guess I am aiming this at people that need inspiration. Those people that are languishing through life consumed by the overall lack of humanity around them. Negativity breeds negativity. Natural human motion brings inspiration. It's hard to be angry after a nice hike through a pine forest. Even if you are training but you do very similar workouts each week you will benefit from a change. Go out and get some inspired motion. Today: Do the thing that you find the most physically challenging. Why? 1) It will improve your overall confidence. 2) If it is difficult your body craves it (within reason). One year ago ... already? Ironman St. George was one year ago this weekend! The past year has been a blur in some respects and a slow-motion, multi-colored dream in other ways. Perhaps that is dehydration or lack of nutrients ... I'm not sure. What I am quite certain of is that I am motivated, fortunate and ready for most any challenge. I sort of like that. As far as physical health; one year later I can honestly say I am better off now that I was last May. I am the same exact weight as I was going in to last year's race. I am not nearly as sore and over-trained. I am a much better runner than I was at this point last year. My cycling is as strong as it was even though I am not out doing 100 milers every weekend. As far as mental health; it's a no brainer ... I am nowhere near as crazed and dazed as last year. In fact, most of the time what little brain I have functions very well. There's much to do on the house. We are moving on to some of the outdoor projects. We have painting, maintenance and landscaping projects to do. There's always something for which to train. I like that. My main focus right now is getting Carrie back to running. 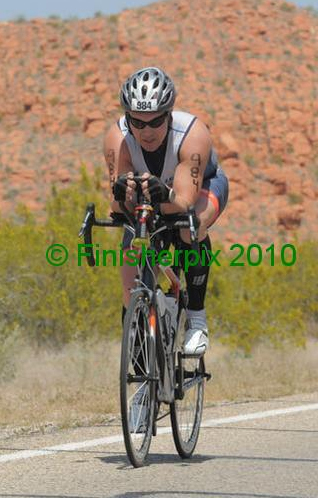 The Havasu 70.3 is in November and we've made great progress with her knees over the past 6 months or so. Before Havasu there's the Pike's Peak Ascent weekend on August 17th. I've been running uphill most of the year and that will remain the same. I will come in to that run both lighter and stronger than ever before. I look forward to it.